Promised Lands is famed writer and critic Susan Sontag's sole documentary project (and her third directorial effort), shot in Israel on the fly in the final days and immediate aftermath of the 1973 Yom Kippur War. Not only does the film scrutinize the ongoing Arab-Israeli conflict, but it also brilliantly underscores the deepening divisions within Jewish thought over the very question of Palestinian sovereignty as well. Banned by Israeli authorities upon its initial release, this visually visceral portrait of a land torn apart by the competing values of militarism, consumerism and religious national identity is as prescient and thought provoking as ever. 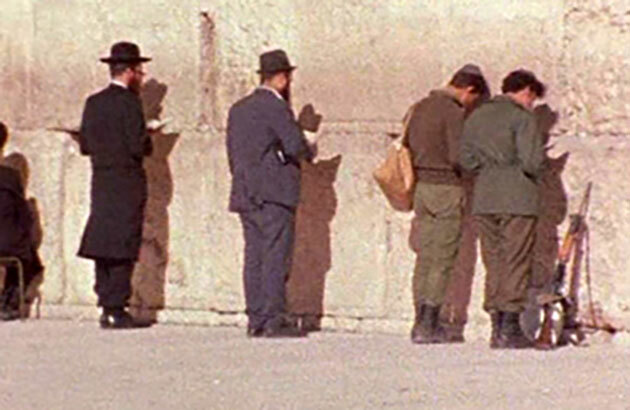 Flooded with strikingly rendered observations of a modern Israel, Promised Lands is replete with war-torn desert landscapes, ancient synagogues and mosques, roadside military patrols, devotions at the Wailing Wall, modern shops and movie theaters and a wax museum depicting official state history. Intercut throughout the harshly beautiful imagery are conflicting commentaries by two noted Israeli thinkers: Yoram Kaniuk, celebrated writer and a supporter of Palestinian rights who sees Israel shifting from its socialist roots to an American-style commercial culture; and renowned physicist Yuval Ne'eman, who argues that the endemic nature of Arab anti-Semitism makes continual conflict between these historically related peoples inevitable.